Hi, I am interested in your 1979 Dodge Li'l Red Express (stock #CTP2391) listed on Autotrader for $19,900. I'd like to get more information about this vehicle and confirm its availability. 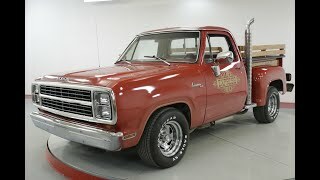 Worldwide Vintage Autos is pleased to present this 1979 Dodge Lil Red Express Adventurer Truck. Two family owned truck. Rare! The D/W series was a line of pickup trucks that was sold by Dodgefrom 1961 to 1993. The same basic design was retained until the 1994 introduction of a completely redesigned Ram. The D/W series shared its AD platform with the Dodge Ramcharger/Plymouth Trail Duster twins. 4x2 models were designated D, while 4x4 models were designated W.
-Dodge Red. Appears to be 90%+ original paint!